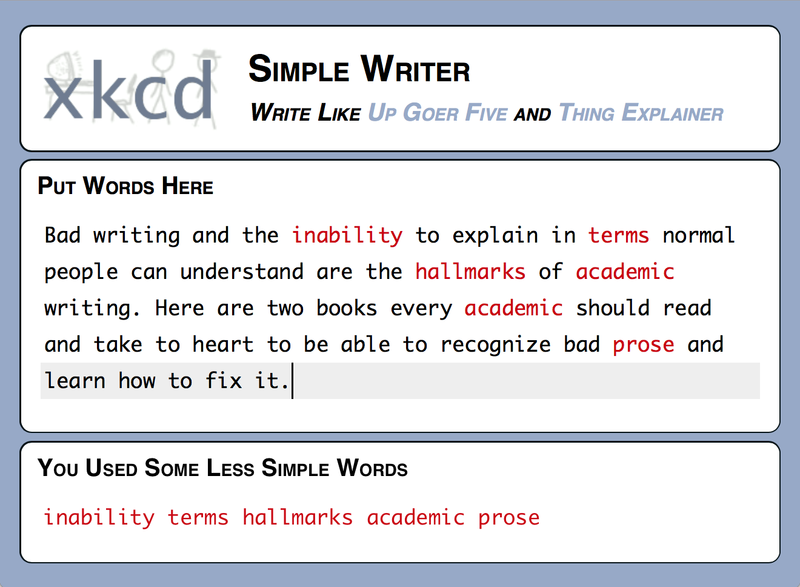 Bad writing and the inability to explain in terms normal people can understand are the hallmarks of academic writing. Here are two books every academic should read and take to heart to be able to recognize bad prose and learn how to fix it. Munroe is the guy behind the xkcd web comic. In Thing Explainer, he uses his signature style to explain machines and processes in simple drawings and words. He limits himself to the “ten hundred” most common words in English (the word “thousand” did not make the list) to do that. The explanations are by no means simplistic though, and the drawings are very clever and contain lots of little in-jokes. The small vocabulary used means no jargon, no difficult or unusual words at all. But the beauty of Thing Explainer goes beyond that. Take a look at Up Goer Five and note how he describes the different parts of the rocket: not what they are, but what they do. So much bad academic writing describes things as what they are, but never explains what they are actually good for and why anybody should care. Munroe has also created a clever little web app that will flag words not on the list of one thousand most common. That certainly isn’t a practical way to write, whether academic papers or blog postings. But it’s instructive to see just how many words you’d expect to be extremely common really are not. 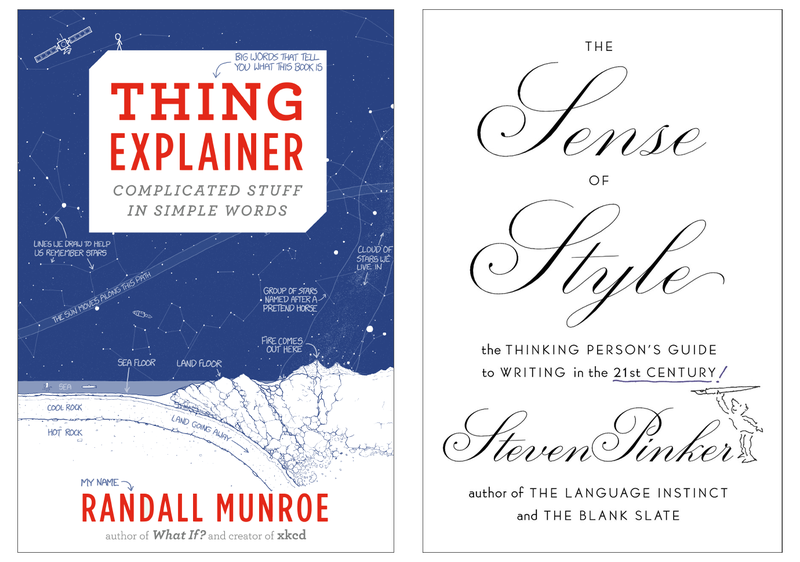 Steven Pinker’s book The Sense of Style is not just a book about grammar and how to write well, but it’s actually written very well itself. Pinker’s writing is lively, witty, crystal clear, and simply a pleasure to read. Just reading a page or two is a great way to prime yourself before you sit down to write. It will improve your paper, book, or whatever you’re working on. What does a psychologist know about grammar? Pinker is not just extremely smart and one of the world’s leading psychologists, but also the chair of the usage panel of The American Heritage Dictionary. This man knows his stuff. And it shows in every single rule he explains and myth he dispels. And there are many myths and nonsensical rules (like, never start a sentence with and). About a third of the book is a long list of topics that he works through methodically. That part feels like a bit of a laundry list, but it also serves as a useful reference when deciding what to do or when settling an argument. Pinker is very respectful, but he’s also clear in his criticism. While he keeps talking about Strunk and White in a referential tone, he also demolishes large parts of the nonsense that book is spreading (and points to some of the internal inconsistencies and errors it contains). The Sense of Style is the book to replace Strunk and White. It’s high time, too. Pinker’s book is based on real research, a much better understanding of language, and the way language is used today (instead of 100 years ago). The two books are very different, which makes them such a beautifully complementary pair. One explains grammar and good writing in great detail, the other puts it into practice in a fun and engaging way. Both are very insightful and can teach you a lot about what it means to communicate well. Both also make great gifts. No academic can be offended to be given a book written by Steven Pinker, and no nerd(y academic) can object to a book from Mr. xkcd. Thank you for this. I’ve been interested in Thing Explainer and I hadn’t heard about the other one. I’m writing more user help guides now and these both look useful. Did you mean he talks about Strunk and White in a reverential, rather than referential, tone?